If your key breaks on you as you try to get back into your house after a long day, don’t get frustrated- it happens more than you think. According to AAA, more than 4 million people are locked out of their cars and homes every year so you can be sure that it happens every day. Therefore, if you think the key is broken in the lock, do not try and reinsert the key- instead, try to remove it. If the key is broken, hold on to the parts, if you have them, and your local locksmith will be able to make a key of the pieces. If the key piece is stuck in the keyhole of the cylinder, try these few steps to help make the key extraction process easier. Begin by applying lubricant or graphite or some form of dry lubricant. Oil-based lubricant such as WD-40 will also work. When using graphite spray, be aware that it will stain its surroundings very easy upon using it. Apply directly to the keyhole only.Now, you will need needle nose pliers to help with the extraction. Keep in mind that the lubrication process can help remove the broken key, but the pliers will pull it free. In emergency situations, these materials can be quite helpful to have and use upon retracting the broken key. When using tweezers, your concern should be the thickness of the tweezers. If the key is protruding out from the keyhole, even a little bit can help with the extraction. However, if the key is too far back, the problem would then be that the tweezers can push the key further in. A broken key extraction tool is a more professional solution to this problem. Just like picking tools, the extractor tools come in set varieties. Some people use a single hook key and others a double hook key. In my opinion, this is the best deal when looking to purchase this tool. One or two of these will get the job done. A great alternative would be to make a broken key extractor out of a small jigsaw blade or even a mini hacksaw blade. Enter the blade in the keyhole, with a turn of the blade and a pull, your key should be out. 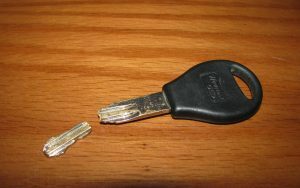 Super glue can work wonders when removing your broken key from the lock, although it can also seem very counterintuitive. This method works best when the key is more accessible and visible rather than out of reach. The trick is to superglue one end of a match or small wire or paperclip and try and reach the broken part of the key and hopefully, it glues together, so it can be removed. If you have a padlock or can remove the cylinder, you can put the lock with the keyhole faced downward and strike it with a hammer or something of similar strength. The key to this method is to try and keep the lock steady and still so that gravity can pull the key loose. If excessive force to the lock was done, consider having a locksmith technician repair the lock or replace the lock at your convenience. There is a method called the Probe and Pull. In this method, you basically line up two pieces of metal alongside the broken key, (both left and right side of the key, not top and bottom), and in doing this you simply apply pressure and pull. It will likely take longer because the key will only come out little by little, instead of all at once. However, it can still be very effective with a little patience. With all the methods we mentioned, any of them should work great depending on the tools you have at hand. No matter the type of lock, if you have the right tools for the job, the key can be extracted. Always have the patience, as this kind of job takes time. Your other option other than having the job done yourself would be to call a locksmith and have it done professionally. Quick Key Services Sherman Oaks is open 24 hours a day to do key extraction, car lockout, rekey, lock change, key fob, and ignition repair services. We also offer a free quote over the phone, and our technicians can be at your location in 20 minutes.